We have already worked for Nike, Red Bull, Monste Energy, Jim Beam, Beefeater and more. SKATE iD /// Custom Skate Factory, from 1 unit. You can share the design you have made in your social networks, download it on your device or make the purchase of a skateboard personl, cruiser or longboard designed by yourself. Wall hanger for 3 full complete longboards or 3 (also for loose boards), made of solid pine wood for decoration of any room to skate or skateboard lounge. Wood: solid pine. Size: 21,7 x7x7 cm. slot: 13 mm. Includes: Bolts and screws for wall. NOTE: This model is painted by hand so it can be different from the image. Pack of 10 units of the hanging bracket set for tables of skateboard and longboard. Includes screws and wall plug. Easy assembly 1 single screw. See video at bottom flange. Wall hanger for 3 full complete longboards or 3 (also for decks only), made of wood with Sapelli skate for decoration of any room or living skateboards. Wood:natural wood. Size: 21,7 x7x7 cm. Slot: 13 mm. Includes: Bolts and screws for wall. Rack/Hanger Stand Skate deck: Hangers for skateboard or longboard. With these wall hanger you can hang your skateboard easily with a perfect result. Patented. Position: Vertical or horizontal (2 unit.). Contains: 1 Wall hanger Mounting screws and dowels. Cardboard boxes for packaging of skateboards or complete skateboards. Ideal for skate shop or online sale of material of skate shops. The same box fits two sizes with a simple cut. Box measures: Full Skate: 83 x 25 x 15 cms. Only table (making a cut): 83 x 25 x 8 cm. Pack of 5 high-quality skate boards manufactured in Europe. Wood: Canadian Maple with perfect pressing. Available widths: 7.75-8 - 8.15 - 8.5 inches. Pack of 30 high-quality skate boards manufactured in Europe. Wood: Canadian Maple with perfect pressing. Available widths: 7.75-8 - 8.15 - 8.5 inches. Griptape Clear transparent: Griptape for skateboards, longboard or cruiser of different colors. Type: Lija grip. 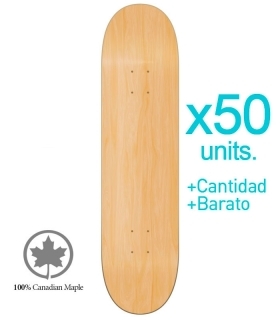 Buy cheaper with this pack of 50 blank decks. Made of maple Canadian maple high quality with perfect pressing. Maple: 7 LPY epoxy. Personalized skateboard with your own design. Deck: Maple U.S.A. Canadian maple in 7 sheets with perfect pressing.Graphic: SlipLayer full color printing.Watch the video below to learn more about this product. Skateboard chalk board to draw normal liquid chalk or chalk. This skateboard is made with the best quality. Wood Canadian Maple 7-ply maple with perfect pressing. Finish: Chalk board paintable surface Size: 80x21 cms. Easy to wipe with a damp cloth. Pack of 20 units of the hanging bracket set for tables of skateboard and longboard. Includes screws and wall plug. Easy assembly 1 single screw. See video at bottom flange. Griptape for skateboards, longboard or cruiser in gold or silver effects. Type: Lija grip. Griptape style TIE DIE Hippie in several colors Measures: 85x23 cms. Self-adhesive. Custom Griptape for skateboards. Griptape rectangular sticker custom specifications: Images. pictures. Design. Illustrations. Texts. If you do not know design help you free of charge * (for compositions of images and text only). Griptape Colors: Griptape for skateboards, longboard or cruiser of different colors. Type: Lija grip.